Before he was boring me to tears putting endless hours of Tolkien tales to film, Peter Jackson used to make horror films. Not many, to be sure. Peter Jackson is not a horror filmmaker. He is a filmmaker who has made horror flicks. His most memorable work in the genre was Dead Alive (Braindead for all you worldly purists out there). That film is memorable for being, perhaps, the goriest horror film of all time. It truly was an exercise in bloody excess, impossible to faithfully convey in a posting to a website. Rather than being a straight scare-fest or gross out, Dead Alive was just as much a comedy as it was a horror film. A few years later, Jackson carried on that idea with, minus the gore, The Frighteners. Frank Bannister (Michael J. Fox) is a small-town hustler with a real problem. Ever since he was in a car accident a few years back, he has been able to see ghosts. Any walk he takes through a graveyard is the exact opposite of the solemnity ordinary folks have come to associate with those places. It turns out, with a little psychic tuning, the idea that the dead sleep in peace and serenity is a myth. Ghosts are just the same, crotchety jerks they were when they were alive. Bannister is able to use his unique gift to pay the bills. Bannister has managed to make a couple friends in the ghost community, and he dispatches the trio (Chi McBride, Jim Fyfe, and John Astin) to haunt houses around the town. Then, fortuitously, the occupants of said homes find Bannister’s business card, offering psychic housecleaning services. Bannister is a fraud, but only insofar as the hauntings are his fault. Honestly, the man should be making a killing. It’s on one of these jobs that Bannister happens upon a cause for numerous unexplained deaths that have been plaguing the town in recent years. It appears that the Grim Reaper has taken up residence in town, and Bannister is the only living person who can see it. Of course, since he’s alive, there’s not much he can realistically do to stop this malevolent being. The rest of the film is Bannister doing his best to vanquish what seems to be Death itself. Michael J. Fox is a treat in this film; almost a guilty pleasure. From 1996, this film represents the tail end of Fox’s regular film career. Beyond the Back to the Future flicks, Fox had been a successful big screen commodity, but he was completely overshadowed by his role as Marty McFly. (How overshadowed? It never occurred to me to write this review and NOT mention Back to the Future.) As such, the exasperated nature with which Bannister goes through his daily life can easily be construed as the stresses of real life invading on Fox’s performance. If that is indeed the case, it only makes his performance more compelling. Of further note is Jeffrey Combs’s performance as an unhinged FBI agent who believes that Bannister is behind all the deaths. He’s not unhinged the way audiences are used to seeing an obsessed law enforcement officer in film. He’s not a crusader. His Agent Dammers is a total loon. And he’s rocking a Hitler haircut. Many times adding a peripheral villain is an unnecessary waste of time in a movie. One bad guy or set of bad guys is enough. But I couldn’t imagine this film without Agent Dammers clogging the works with his insane eccentricities. Combs alone is worth the price of admission to this film. Peter Jackson’s direction shows that, at one time, he was capable of having a light touch. Yes, everything in this film is tightly controlled, so much so that there is some disconnect, like the film takes place on a vast stage, but the oppressive gravitas his films have become notable for is entirely absent in this film. The world he has crafted is one always teetering on the edge of absurdity. It’s also provincial, in a way. The town in the film, while taking place in the United States, was in actuality a locale in New Zealand. All the overarching accouterments of Americana are there, but there’s enough about the town that is off, that is distinctly not like America, that it provides the film an innate sense of fantasy that it otherwise would not have. 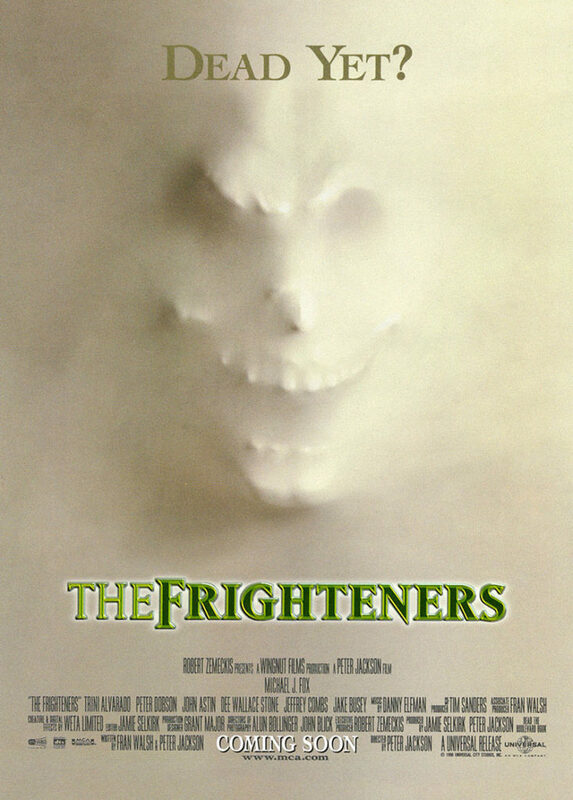 The Frighteners can be considered a horror flick because there are ghosts in it that kill people, but the film is really more of a crossover movie. It’s entertaining, and is a wonderful milestone along a revered filmmaker’s development. It’s not a great movie, but it has a fine sense of style. Think of it as Dead Alive without the blood.